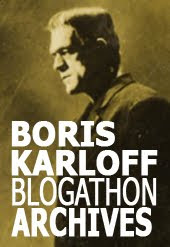 Frankensteinia: The Frankenstein Blog: Rondo'ed! 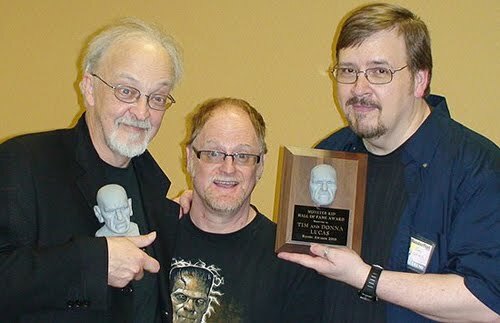 Together again for the first time, the only 3 bloggers ever to win the Rondo Hatton Classic Horror Award for Best Blog! That’s me clutching my trophy with last year’s winner Max Cheney of The Drunken Severed Head (now hosted on the Famous Monsters website) and Tim Lucas of Video Watchblog, winner of ALL the Best Blog Rondos awarded previously. Tim is holding up the Monster Kid Hall of Fame Award he shares with his wife, Donna. The Rondos were handed out at a lively, informal and sometimes emotional ceremony held last week, on May 14, at Wonderfest in Louisville, Kentucky. The affair was MC’ed by tuxedoed Rondo Master David Colton, assisted by the vivacious Linda Wylie. Among the winners present, the Hall of Fame inductees made speeches that went straight to the heart and tear ducts of every Monster Kid and Kidette in attendance. Tim and Donna Lucas delighted us with the story of how they first met. Cortland Hull, honoring posthumous inductee Verne Langdon, spoke movingly of the man’s inspiration and generosity. Artist Bill Stout delivered a heartfelt, deeply touching remembrance of growing up loving monster movies and dinosaurs and, in an unforgettable moment that brought the award itself into vivid focus, he told of how his father had known Rondo Hatton and had remembered him as a kind, gentle and soft-spoken man. 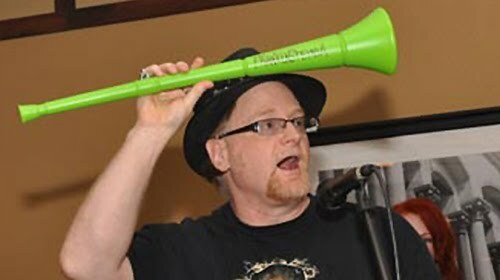 When my turn came up, I was honored to be introduced by my friend Max Cheney, here waving Ygor’s vuvuzela which he threatened to blow just to embarrass me. Max noted that May 14 was an important date in Frankenstein history. It was on May 14, in 1817, that Mary Shelley finished Frankenstein! Here I am babbling away. 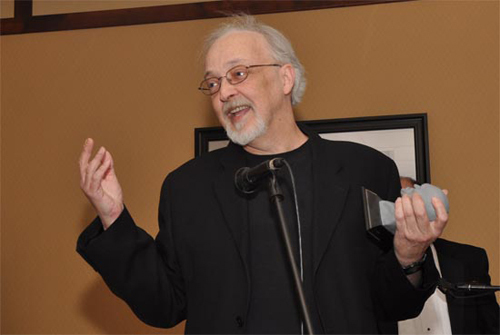 I thanked my readers, who keep me going, and everyone at The Classic Horror Film Board who got me going. Four years ago, I’d already been thinking of doing this blog for a long time and finding the CHFB and people who were passionate about classic horror and interested in new discoveries and new ways of looking at old films gave me that final push, the tipover I needed, and I got started. I still can’t believe I’m part of this, the traditional group shot of winners and special presenters. Front and center (fourth from left) is Kerry Gammill who sculpted the Rondo Award. Rondo celebrations aside, Monster Kids congregate all weekend (and at all hours) in the Old Dark Club House, a hospitality suite designed and operated to his everlasting credit by Gary Prange. 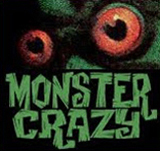 Here, among classic Monster Kid artifacts and souvenirs, you get to hang out, chat and party with fellow attendees. 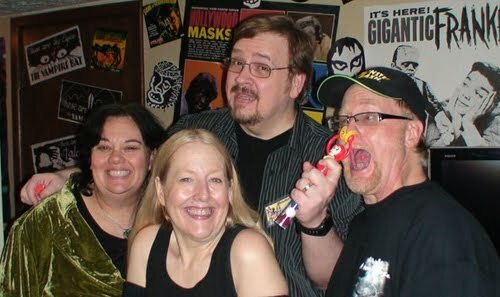 Pictured are some of my favorite people in the world: Jane Considine, Donna Lucas, Tim Lucas, the Mad Monkey and Max Cheney (not sure which is which). I had a blast and my fondest wish is to go back someday and spend some more time at the Old Dark Club House. It’s full of friends I want to see again, and there’ll be new friends to meet. Maybe even you! First and last photos courtesy Tim Lucas. All others by Eileen Colton (check out her website and Etsy shop for some mind-blowing photography). Congratulations :) This is very, very exciting!!!!!! Congratulations Pierre! It was more than deserved! And keep up the good work! Thank you, Emmy. ‘Exciting’ is a good word for it. Attending the Rondos is a lot of fun and you get to meet some really terrific and absurdly talented people. I recommend Wonderfest to everyone. What a weekend! Thank you, Bibi! Winning this award just makes me want to work harder on the blog! A heartfelt congratulations to you and to all of the Rondo winners! Party on! Congratulations Pierre! Also, since I don't know many writers in the blogging world I nominated you for the "Versatile Blogger" award. Hook's: Thank you for the blogger nod!